Since the Roman era, many liquids, including water, have been used as lubricants to minimize the friction, heat, and wear between mechanical parts in contact with each other. Today, lubricating oil, or lube oil, is the most commonly used lubricant because of its wide range of possible applications. The two basic categories of lube oil are mineral and synthetic. Mineral oils are refined from naturally occurring petroleum, or crude oil. Synthetic oils are manufactured polyalphaolefins, which are hydrocarbon-based polyglycols or ester oils. Although there are many types of lube oils to choose from, mineral oils are the most commonly used because the supply of crude oil has rendered them inexpensive; moreover, a large body of data on their properties and use already exists. Another advantage of mineral-based lube oils is that they can be produced in a wide range of viscosities—viscosity refers to the substance's resistance to flow—for diverse applications. They range from low-viscosity oils, which consist of hydrogen-carbon chains with molecular weights of around 200 atomic mass units (amu), to highly viscous lubricants with molecular weights as high as 1000 amu. Mineral-based oils with different viscosities can even be blended together to improve their performance in a given application. The common 1OW-30 motor oil, for example, is a blend of low viscous oil (for easy starting at low temperatures) and highly viscous oil (for better motor protection at normal running temperatures). 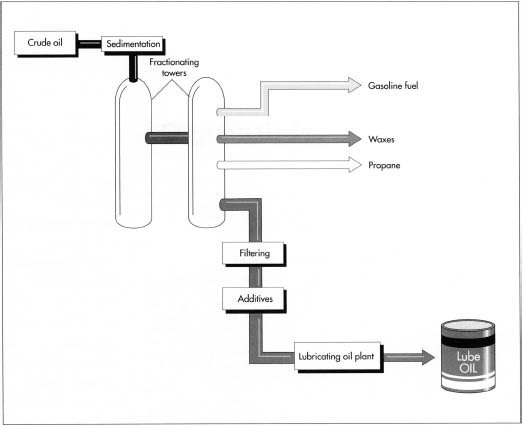 Lube oils are just one of many fractions, or components, that can be derived from raw petroleum, which emerges from an oil well as a yellow-to-black, flammable, liquid mixture of thousands of hydrocarbons (organic compounds containing only carbon and hydrogen atoms, these occur in all fossil fuels). Petroleum deposits were formed by the decomposition of tiny plants and animals that lived about 400 million years ago. Due to climatic and geographical changes occurring at that time in the Earth's history, the breakdown of these organisms varied from region to region. Because of the different rates at which organic material decomposed in various places, the nature and percentage of the resulting hydrocarbons vary widely. Consequently, so do the physical and chemical characteristics of the crude oils extracted from different sites. For example, while California crude has a specific gravity of 0.92 grams/milliliter, the lighter Pennsylvania crude has a specific gravity of 0.81 grams/milliliter. (Specific gravity, which refers to the ratio of a substance's weight to that of an equal volume of water, is an important aspect of crude oil.) Overall, the specific gravity of crudes ranges between 0.80 and 0.97 grams/milliliter. Lubricating oil is refined from crude oil. After undergoing a purifying process colled sedimentation, the crude oil is heated in huge fractionating towers. The various vapors—which can be used to make fuel, waxes, or propane, among other substances—boil off and are collected at different points in the tower. The lube oil that is collected is filtered, and then additives are mixed in. refined oil to give it desired physical properties. Common additives include metals such as lead or metal sulphide, which enhance lube oil's ability to prevent galling and scoring when metal surfaces come in contact under extremely high pressures. High-molecular weight polymerics are another common additive: they improve viscosity, counteracting the tendency of oils to thin at high temperatures. Nitrosomines are employed as antioxidants and corrosion inhibitors because they neutralize acids and form protective films on metal surfaces. 3 The remaining 20 percent of the oil is then reheated and pumped into a second tower, wherein vacuum pressure lowers the residual oil's boiling point so that it can be made to vaporize at a lower temperature. The heavier compounds with higher boiling points, such as tar and the inorganic compounds, remain behind for further processing. 4 After further processing to remove unwanted compounds, the lube oil that has been collected in the two fractionating towers is passed through several ultrafine filters, which remove remaining impurities. Aromatics, one such contaminant, contain six-carbon rings that would affect the lube oil's viscosity if they weren't removed in a process called solvent extraction. Solvent extraction is possible because aromatics are more soluble in the solvent than the lube oil fraction is. When the lube oil is treated with the solvent, the aromatics dissolve; later, after the solvent has been removed, the aromatics can be recovered from it. Of all the properties, viscosity, a lube oil's resistance to flow at specific temperatures and pressures, is probably the single most important one. The application and operating temperature range are key factors in determining the proper viscosity for an oil. For example, if the oil is too viscous, it offers too much resistance to the metal parts moving against each other. On the other hand, if it not viscous enough, it will be squeezed out from between the mating surfaces and will not be able to lubricate them sufficiently. The Saybolt Standard Universal Viscometer is the standard instrument for determining viscosity of petroleum lubricants between 70 and 210 degrees Fahrenheit (21 and 99 degrees Celsius). Viscosity is measured in the Say bolt Universal second, which is the time in seconds required for 50 milliliters of oil to empty out of a Saybolt viscometer cup through a calibrated tube orifice at a given temperature. The specific gravity of an oil depends on the refining method and the types of additives present, such as lead, which gives the lube oil the ability to resist extreme mating surface pressure and cold temperatures. The lube oil's color indicates the uniformity of a particular grade or brand. The oil's flash and fire points vary with the crude oil's origin. The flash point is the temperature to which an oil has to be heated until sufficient flammable vapor is driven off so that it will flash when brought into contact with a flame. The fire point is the higher temperature at which the oil vapor will continue to burn when ignited. Nadkarni, R. A., ed. Analysis of Petroleum Products & Lubricants. American Society for Testing & Materials, 1991. Bienkowski, Keith. "Coolants and Lubricants: The Truth." Manufacturing Engineering. March, 1993. "System Provides Real-Time Lube Oil Blending." Design News. February 26, 1990, p. 39. O'Lenick, Anthony and Raymond E. Bilbo. "Saturated Liquid Lubricant Withstands Aluminum Forming." Research & Development. February, 1989, p. 162. Peterson, Ivars. "Friction Features." Science News. April 30, 1988, p. 283. Templeton, Fleur. "The Right Lube Job for Superhot Ceramic Engines?" Business Week. May 18, 1992, p. 113. Vogel, Todd, John Rossant, and Sarah Miller. "Oil's Rude Awakening." Business Week. September 26, 1988, p. 44. More and more lube oils are made using hydrotreatment which is not mentioned in the article. With this technolgy envirionmentally friendly production of very highly refined oil can be achieved without the use of solvent extraction. Furthermore very heavy crudes, of which there is plenty in the ground, can be utilized. Could you please let me know what is the boiling point of lubricating oil? The diagram of the 2 distillation column is not clear enough. e. g (1)thetop product of the V.distillation column is gasoline while prpane product is the second product from the bottom? 1- the products of an atmo.distillation column from the top to the bottom are,Gas,total naphtha, kerosine, LGO,HGO and residue. can you tel me from which slot we pull the lubricating oil? Want to have details on it. It's ok, bt nt into details. Give us the details as what a chemist will carrx more reserch on. Details on the constituents of the additives used and also the diffrent kind of lubricant oil that can be produced from base oil. What additives should I use in making lubricating oil but with the base stock algal oil?